Bear and Rabbit are the best of friends. They do everything together. They live in their bear/rabbit house, cook in their bear/rabbit kitchen and spend summers in their bear/rabbit treehouse. Then one day they find a wonderful shiny thing. That’s when the problem starts, they can’t agree who the shiny thing belongs to. The shiny thing could be the end of a very special friendship. Is there any way to fix things. 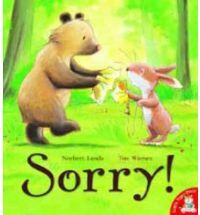 A wonderful story of sharing and being sorry and is accompanied by lovely illustrations.